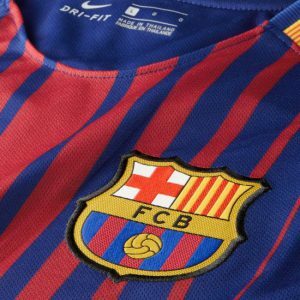 One of the most iconic images in football, the kit of FC Barcelona for 2018 is the visual identity of the Catalan club. A constant presence in the Champions League, Barca is one of the most powerful teams in football and often one of the most spectacular. From the wall of ter Stegen in net through the cool and collected control of Gerard Piqué and Jordi Alba in defense to the virtuosity of Javier Mascherano and Andrés Iniesta to the lethal finish of Lionel Messi and Denis Suárez the team can deliver devastating results and is capable of most incredible comebacks. But Barcelona is more than a club. It is a symbol of Catalan culture and full of rich history. Simply put, Barcelona and its fans tell a story. And it’s all represented by its colours. Let us then pay homage to this symbol of the phenomenon that is FC Barcelona – its shirt. The FC Barcelona home shirt is steeped in deep tradition. It has always been blue and red and this year’s version is no exception. Anyone who knows Barca – and that’s likely everyone who hasn’t lived under a rock in the last century – knows that the home jersey of the club is synonymous with one thing – stripes. They are usually vertical, glorious and very satisfying for any true fan. This year however, the stripes have taken on a different configuration. For the first time in history, the stripes of this season’s Blaugrana jersey are attenuating, which means that they reduce in width the further away they go from the centre. This look is new and unique and very appealing, with a modern touch. The red simply fades away as it travels towards the sleeve. Then, out of the blue (excuse the pun, but it was hard to resist!) another red stripe appears under the sleeve itself. This one however, is made of stretchable mesh material which expands when a player is in motion, maximizing ventilation in the areas of greatest perspiration. Very clever. 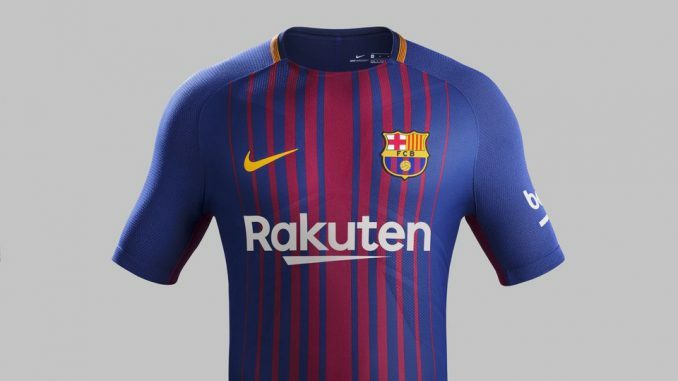 The other striking change on this year’s Barca uniform, aside the obvious stripe configuration, is the wording of the new sponsor. Prior to the 2017-18 season, the club signed a four year deal with the Japanese electronic commerce and internet company Rakuten. The name now replaces the “Qatar Airways” in the middle of the chest and is detailed in white letters. Above it, the Nike hash appears in yellow as it did before on the right breast and more importantly the famous crest of FC Barcelona figures on the left one, just over the heart. Steeped in tradition and history, the jersey of the Catalonian giants comes alive with club pride elements when inspected more closely. The word “Força” can be found on the inner right sleeve and the word “Barça” on the left. The collar features more elements of the club’s culture, including the Catalan flag – Seneyera – around the neck. Although Marc-André ter Stegen will sometimes wear green or yellow, his official top this year is a very sleek black shirt. Long sleeved, it has random geometric patterns on the sleeves and white/gold trim. The alternative version is bright red. The Barcelona jerseys are called Nike Vapor shirts and they are strategically made for football. They have a slim, modern superhero fit which is achieved by raglan sleeves and by strategically engineered knit zones which create a geometric pattern made specifically to fit an athlete in motion. What’s more, they are made of 100% polyester which is constructed exclusively from recycled plastic bottles. Approximately 16 recycled bottles go into each kit. This form of recycling plastic into useful objects is at the forefront of Nike’s Sustainable Innovation project, to which the company has dedicated significant time and resources. The technology provides a surprisingly flexible and durable microfiber that is pleasant to touch. As a result, the Barcelona kits are very lightweight and feel great against the body. The most significant technological features of the Barcelona shirt are the Dri-FIT and Aeroswift innovations. Dri-FIT, which is present in the kits worn by Barcelona players on the field, is a high performance microfiber fabric which moves the sweat away from the body and to the garment’s surface, where it can evaporate quicker. It keeps the player dry and more comfortable. AeroSwift is a similar technology which also helps with wicking sweat away from the skin but most importantly makes it 10% lighter with 50% more stretch. It is this technology that in large respect gives the shirt its superhero fit and which produces a very elastic garment with superior comfort. Equippped with the same fiber innovations as the shirt, the Barca shorts are blue with reversed detailing – the Nike hash on the left leg and the Blaugrana crest on the right. They feature the same stripe found under the sleeve of the jersey – a dark red inset that reveals mesh when stretched. This helps with ventilation and range of motion. A Flyvent waistband keeps the short secure without being too tight and a water-repellent finish makes them ready for any weather. The socks are loaded with Dri-FIT to wick the sweat away from the skin and this is where the technology really shines. They also come with NikeGRIP and are blue with a red pattern on the back and the word “Barca” on the front. For Barcelona fans, the team is not just a football club but a way of life. A feared adversary in any competition, Blaugrana coined the tiki-taka football and has delighted the world with both class and visual mastery. The club takes its image very seriously and has a strong connection with its fans. The visual identity of Barcelona is carefully maintained and this starts with the team uniforms. The jersey of FC Barcelona is “The Shirt That Never Sleeps” and is a symbol of Catalan pride and its connection to the past and present. Wearing the blue and red of Barcelona represents not only the support for the club but a loyalty to all that is unique, passionate and challenging but worth attaining. No, this is not Manchester City uniform but the away shirt of FC Barcelona. It is, indeed, light blue like the Catalan sky on a clear day and it is a return to the 1990s and the 2010-11 season when such colours were popular for away games. It looks great on a green pitch and probably even better on a crowded street. The trims are all similar, although in different colours. The sponsor logo is black while the Nike hash is dark blue. The collar likewise has a stripe running around the neck, but this one is in the colours of the club – red and blue. The inset stripes under the sleeves also feature the club colours, but are cleverly blue under the left arm and red under the right one. Finally, the Blaugrana logo stands out prominently against the blue background by the virtue of being in full colorful splendor. While it’s hard for Barcelona logo to get lost on any background, the light blue one really makes it pop out, to the delight of club pride and of fans everywhere. The shirt features the same Nike garment technologies and design as the home shirt. The accompanying shorts are light blue as well, with inset stripes on both sides. Those, like the Nike hash and club logo are in opposite positions than on the shirt, with red stripe on the left side and the dark blue on the right. Finally, the socks complement the light blue ensemble with a distinct graphic on the back which accentuates speed and the highly visible red letters “Barça” on the front. In contrast to the home uniform, the third kit of a professional football team is worn only occasionally and often made with fans in mind. Barcelona is no exception. The colours are often chosen seemingly at random although for Barcelona white is never an option, for obvious reasons. Therefore, nicknamed “Night Maroon” the shirt is dark red, fading into brown. The colour is not uniform though, as a close inspection will reveal a subtle camouflage pattern in slightly different shades of maroon. This creates a very interesting visual effect, but only from close range. The sponsor lettering once again returns in full white, while the trims have a rather exciting orange hue (dubbed “Hyper Crimson”), including the word “Unicef” on the lower back. The third shirt is the only one with stripes on the shoulders and with the collar of same colour as the shirt. The inset panels under the arms are still there, but now invisible due to being maroon as well. The accompanying shorts and socks are of the same colour. Nike makes Barcelona kit in two versions. The Vapor Match Jersey is the same shirt that the players wear on the pitch. 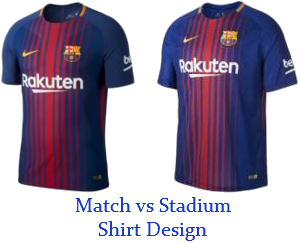 It comes with all the features and technologies described above and it can be seen every time Barcelona plays, because that is exactly what the team wears during the games. The Vapor Stadium jersey – on the other hand – is the official fan replica version. It is nearly identical in design, but there are small differences, even if hard to spot. Both are available for purchase, but the Stadium jerseys are simply more affordable. There is one feature to keep in mind however, if planning to acquire an official Barcelona top. The Vapor Stadium shirts (the fan version) are looser fitting. Remember that superhero design look we talked about above? That looks great on a fit, 20-year old athlete who plays football for hours a day, like Jordi Alba or Gerard Piqué, but it may stretch in strange ways on someone of different shape. This is where the fan shirt comes in. It’s looser fitting and more forgiving. It still looks great but it won’t bunch up in all the wrong places. Finally, the fan shirts come without the AeroSwift technology, but they still have Dri-FIT. If you are interested in supporting the Catalan giants in style, choose the right shirt to your liking. We recommend the current season’s Nike Vapor Stadium jersey (official fan shirt) which ships right to your home. For other Barcelona fun stuff, have a look here. There is no doubt that Barcelona is a world class phenomenon. Love them or hate them, it’s hard to sit still when Iniesta makes a calculated pass or when Messi receives it. Deeply rooted in Catalonian culture, the club has its own story to tell. And it looks the part. Will it be able to wrest Champions League control away from its arch rivals from Madrid? How do you rate Blaugrana’s talent and football power? And how do you view the kit of FC Barcelona for 2018? Let us know below! I like how simple your site is and how you have showen the true passion of producing a wonderful brand and product. I’m not the biggest soccer fan because in my country everyone is rugby crazy. But I have to note the level of “tech” that goes into these uniforms. It is incredible that this can make for a more comfortable and ultimately better player. I guess that’s why they cost what they do. Like everything in life, you get what you pay for. Indeed! And the rugby shirts now follow a similar design, although I bet they are a bit more durable, seeing how they go through more “punishment” during games. Never knew so much went into creating fabric. This was very intresting to read and I wish you the best of luck mate. You can’t go wrong with Barcelona jersey these days, it seems! Enjoy the holidays!